SPRAY the steaks liberally with oil and sprinkle with salt flakes. Cook on a preheated char grill plate or BBQ until cooked as desired. Cover and rest for 5 minutes. SPRAY the bread with oil on both sides and cook under a hot grill until golden. 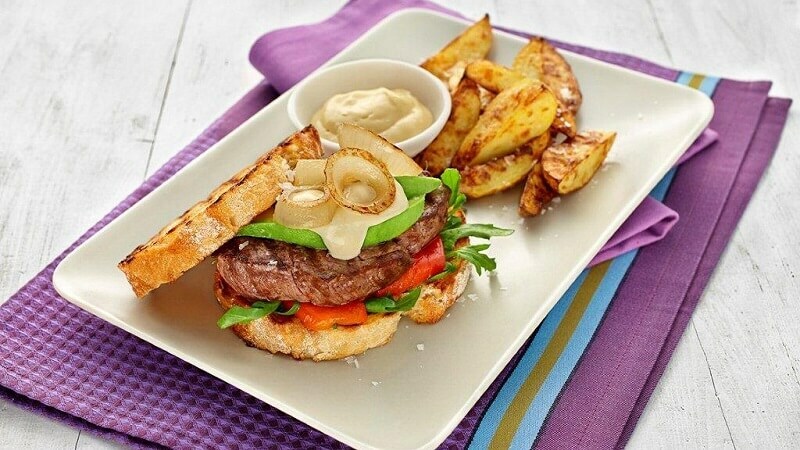 PLACE 4 slices of toasted bread on individual serving plates and top with rocket leaves, capsicum, steak, avocado, aioli and onion rings. Top each with remaining bread slices to sandwich. Serve immediately with potato wedges. TIP: Save time by using roasted capsicums from the delicatessen if desired.